Maybe you’re not bothered with your golf score and just want to hit balls and putter around the course. You’re certainly welcome to do so, but there are some advantages to keeping score (also read: Handicap, the Great Equalizer). 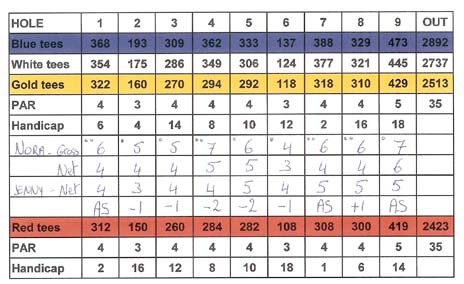 Apart from being a note pad for your golf score, score cards hold a wealth of information. Yardages of each hole for the different sets of tees and total yardage for the course. Par score for each hole. Handicap of each hole: the “toughest” hole to play is marked 1, the easiest is 18. Course slope and rating to determine your course handicap. Picture of each hole that shows the layout and hazards (water, bunkers,..). Layout of the course that shows you in which direction the next hole is. In the open spaces, you have room to write down your name, your gross score and your net score. With a little preparation before starting your round, keeping track of your score will be a breeze. No complicated math required! Write down your gross score (total number of strokes played) for each hole. Make sure you put your name on the card, sign and date it, have a playing partner attest to your score and turn it in or submit your score online to be processed for your handicap index. If you do have a handicap index, you have to figure out how many strokes per hole you get to deduct for your net score. 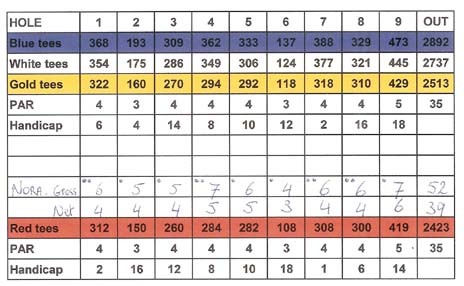 Step 1: starting from your handicap index, determine your course handicap. Step 2: In a corner of the score box underneath each hole, put a little dot for each stroke of handicap you have, starting with the toughest hole (marked “1”). Continue until you get to 18. Step 3: If you still have strokes left on your handicap, start over by “1” and add a second dot. Repeat this process until you have used up all your handicap. 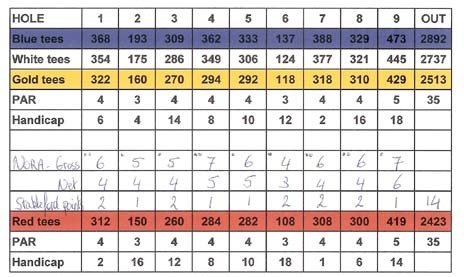 The number of dots in every box represent the number of strokes you can deduct from your gross score to get your net score on each particular hole. The dot-method to figure out your golf score is fast, easy and saves a lot of calculating during the round. It works for all individual playing formats. Stroke play: method described above. Match play: instead of writing down your net score you compare it to the net score of your opponent. If your score is lower, you won the hole and are now “1 up” and write down +1, if your opponent won the hole, you are “1 down” and write –1. If you had the same score (halved the hole), put “AS” for all square. Continue to add or subtract one for the following holes, or keep the same score when the hole is halved. Stableford: is a stroke play format in which your golf score is made up of points you get for your net score per hole. If your net score is equal to par for the hole, you receive 2 points. If you had a net bogey (1 over par), you get 1 point. For a net birdie (1 under par), you get 3 points and an eagle (2 under par) lands you 4 points.